You can have the best furnace installation possible. Here is how we do it. Nearly all furnaces installed by others do not pass manufacturer start-up tests. ​This can leave a furnace outside of manufacturer guidelines and open to warranty denials! Which features should be compared when buying a furnace? ​Efficiency. Look for the Energy Star rating. The higher the number the better. The best furnaces offer Focus on Energy Rewards. Quietness. The best furnaces are quiet. Comfort. Staged-furnaces introduce heat gradually and evenly. Which furnace is the best? ​The best furnace is one that is installed per manufacturer guidelines. Manufacturer warranties do not cover inferior installations. We study manufacturer guidelines and continuously train our team on current practices. Our goal is to provide top-shelf workmanship. Boilers. Unmatched comfort and efficiency. Sadly, most heating companies don't even know where the circulator is supposed to go. Nearly every boiler we see that was installed by others has been installed incorrectly! ​We love boilers and have studied hydronics extensively. - A new boiler installed by others and what we did to correct all of the mistakes. - Saving space. Before (old boiler and water heater) and after (new boiler with a water heater inside). ​We think so. When done annually, furnace tune-ups can prevent premature failure of components, expensive repair costs, and down time. Tune-ups take about 45 minutes. Pricing is here. temperatures, burners, filters, carbon monoxide, condensate traps, differential pressures, flame sensors, and gas leak search. Boilers need tune-ups too. 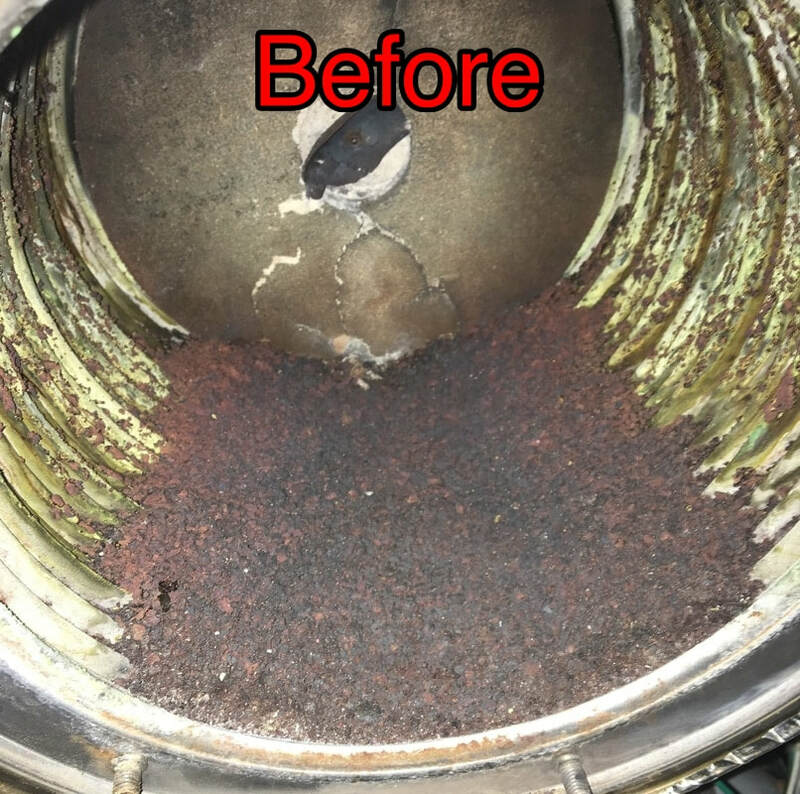 Pictured below left, the black and green scaly gunk prevents heat from transferring to the water, thereby making the boiler far less efficient. Pictured below right, the boiler is ready to deliver full efficiency. Tune-ups take about 45 minutes. Find pricing here. ​Pros of Forced Air, In-floor, and Radiant Tube heat. Including Garage Heating. Kicking it old school in-floor heat back in 2005. Radiant tube heaters are often the best option to heat a garage.